Today we continue our journey, but not only through the miles of transit routes and the endless lines of like minded pilgrims all trying to get to the same venues and sites, but also moments of beautiful spiritual journeying both reflective and exuberant. The day began for me with a quiet walk through our beautiful village of Psie Pole (Dog’s Field) taking in the quiet simplicity of the lifestyle in this lovely community that has opened is arms and hearts to our young people. 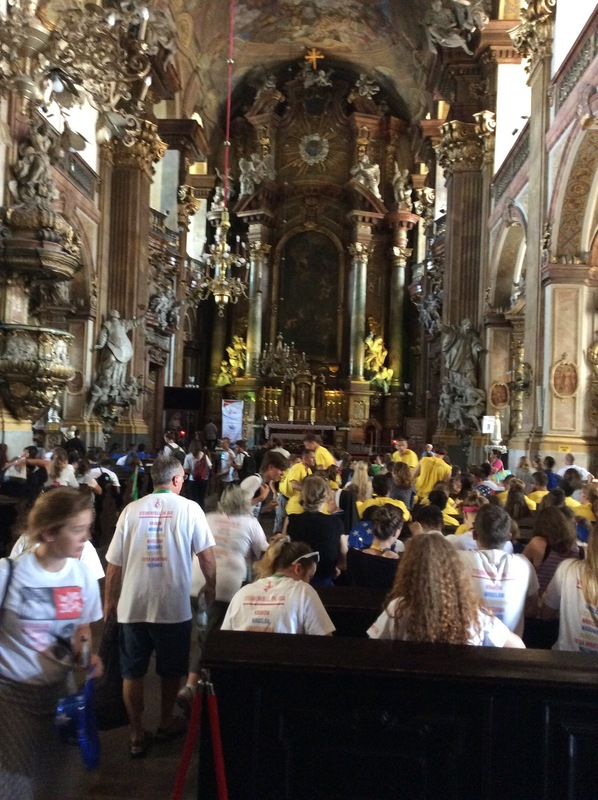 The pilgrims began to gather for the beginning of our physical journey to Cathedral Island in the centre of Wroclaw laden with snacks and treats provided by their gracious host because they don’t want them to go hungry! Because we board our public transit in our small town, travelling to our events is always easy. Not so the return…but that’s for later. Cathedral Island is the oldest part of Wroclaw surrounded by the waters of the Oder River, the former stronghold which gave rise to the city is stunningly beautiful. The architecture alone is breathtaking. The most impressive among them are the Gothic St John the Baptist’s Cathedral and the Holy Cross Church, restored after WW II. The Island today was a veritable fortress secured by police and military personnel. Access was limited to accredited pilgrims and cars were not allowed on without a complete search. Once on the site the energy was palpable. Bands playing, groups singing and dancing in locations throughout the site. Our first stop would have us pass through the Door of Mercy at the Cathedral. Each group was given a specific time for arrival. As we approached the Cathedral via a well thought out route by the organizers the decibel level just keep increasing. By the time we reached the front of the Cathedral the sea of humanity that lay before us was a boisterous crowd of singing, dancing young people from across the globe. Perhaps a strange image to imagine as you approached the Door of Mercy. But as we got closer we realized that the Cathedral would filled and the door closed to the outside world. There wasn’t a steady stream of pilgrims flowing through- once it was our turn we understood why. Just as we approached , and the door opened – a voice announced that we would pass through the Door and have an opportunity to sit with Jesus for a while. The profound silence that fell as we enter was powerful indeed. Hats came off, all talking ceased and quiet, penitent filled the church and fell to their knees. You could still hear the revelry outside until the sound of the door closing and then …..nothing! You could barely hear the outside world – for ten minutes it was just you and God…a time for reflection and prayer. I was reminded powerfully just how much “noise” there is in our lives trying to distract us from these moments of deep reflection and prayer. ….the Blessed Sacrament was elevated, the bell rang and we all filed out to allow the next group this restful, reflective pause in their journey. Just over a hour was given for exploring the Island and all the activities taking place before heading to a special Mass for English pilgrims. Some of us attended a mini concert by a a chamber choir, others wandered the island and we all found time for gelato ! 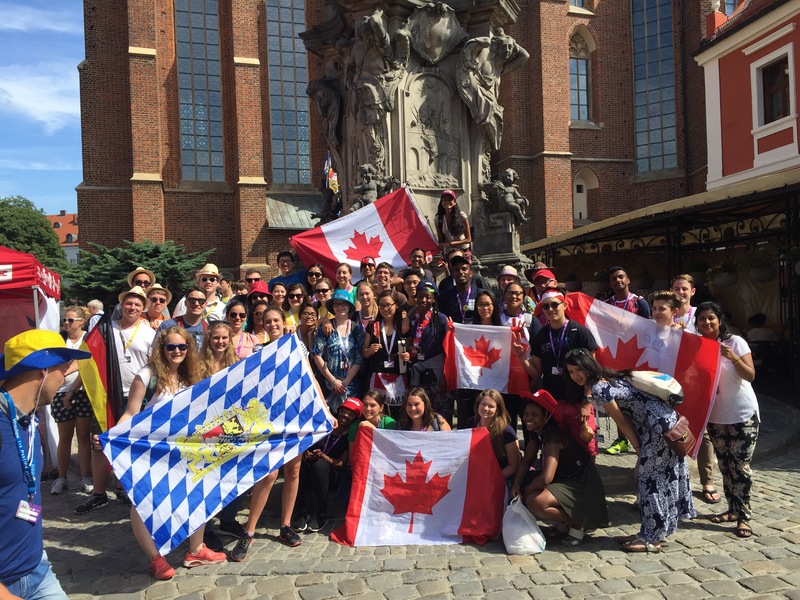 By 1:00pm we had been divided into language groups and processed through the streets singing Canadian and American national anthems and waving to the Crowd as we passed ….heading to the University Church, Holy Name of Jesus. Once again this was all taking place in 30+ scorching degrees. Inside this beautiful Baroque church filled to the brim with English speaking pilgrims we shared a lovely Mass with the a auxiliary bishop of Edmonton, Bishop Gregory Bittman. 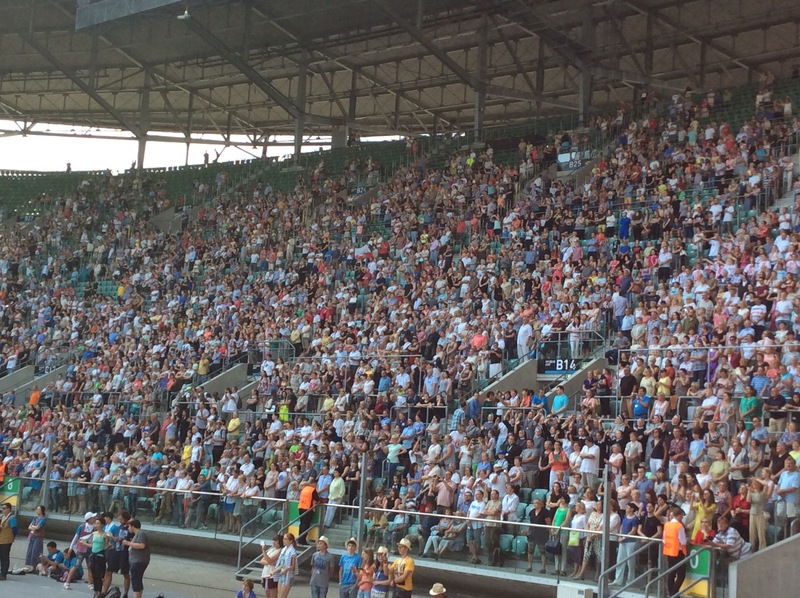 After Mass the fun began…we were to travel to the Wroclaw stadium for an “intimate” supper with just over 35,000 of our closest friends. It would take far too long to explain the circuitous route we had to take crammed on public transport and then a thirty minute walk just to get to the site, but we did…..and not a complaint to be heard! Following dinner we staked out our spot of the floor of the arena for the concert! 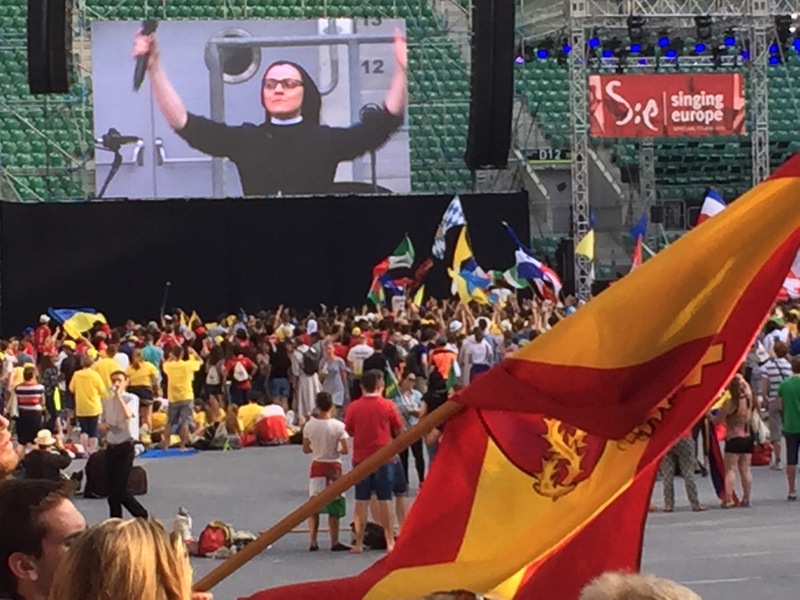 Such energy , enthusiasm and spirit of friendship….as pilgrims danced sang and played together – with pilgrims, guests and local individuals we were close to 50,000 strong. 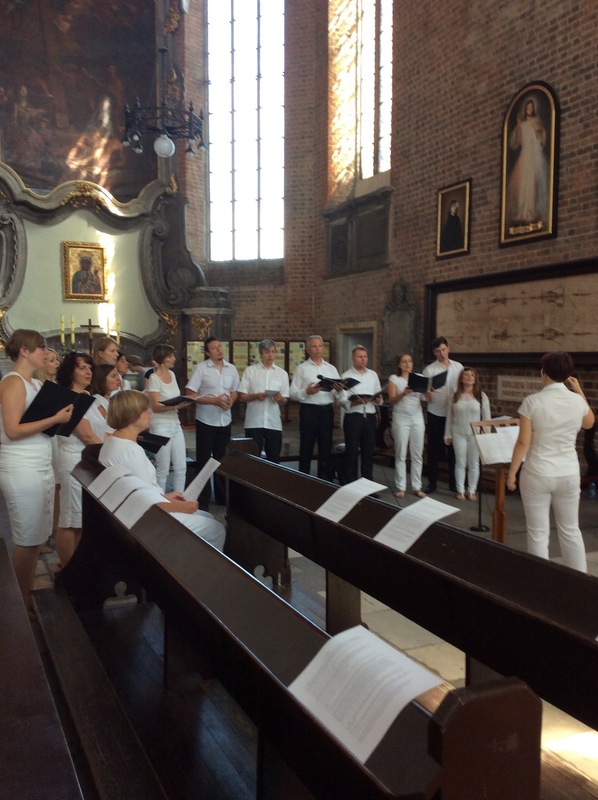 A long day, many great experiences and the journey continues……tomorrow our last day in Wroclaw prior to our departure for Kraków. The Ramblings of an Aging Pilgrim !